Popular Internet Communications network, Skype has been targeted by internet fraudsters across multiple media in recent days with both a Trojan originating from scam emails, and worms affecting the Skype communication platform. 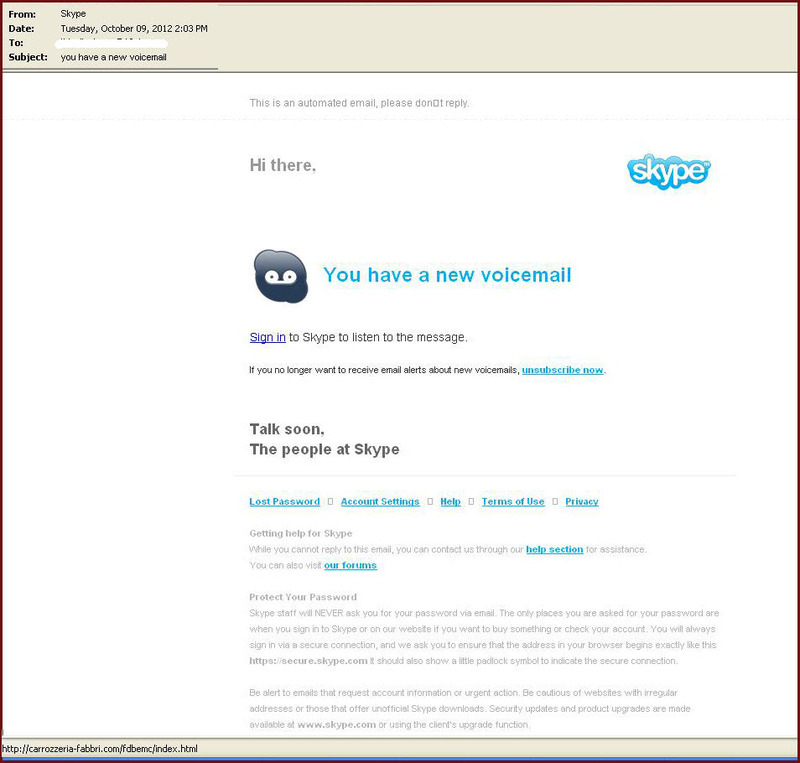 An email purporting to come from Skype with subject heading “you have new voice mail”, claims that the recipient has a new voicemail and instructs users to log into their Skype account to listen to the message, by clicking on the link in the email. The email seems to be genuine, it has similar body content and the official Skype logo that usually comes with legitimate skype voice mail alerts. However the email is certainly not from Skype but designed to lure Skype users into clicking the malicious links provided in the fake alert and then unwittingly download a file containing a Trojan horse malware file. This could open backdoor giving hackers access to hijack infected PCs and recruit them into a “botnet army” which are used to distribute further spam and malware. Botnets are often used to mount distributed denial of service (DDoS) attacks – forcing websites offline – to run spyware or to send out spam emails. Users can even be locked out of their machines and held to ransom. Internet users should be very cautious of any unsolicited emails from service providers and financial institutions that ask them to click a link and provide personal information. If the sentence “lol is this your new profile pic?” – or similar – appears as an instant message from one of your Skype contacts, don’t click on the link attached to the message. If you click the link, it could launch the download of malicious software, a variant of the Dorkbot worm. When the worm infects a computer it sends out the “lol” message to the user’s contact list. The malware is therefore spreading fast, as curiosity gets the better of many users. Worm.Dorkbot is a malicious worm that spreads through instant messaging services such as Windows Live, MSN, Skype and Yahoo! Messenger, and removable drives. This malicious worm also contains backdoor functionality, which will allow remote attackers complete access to the infected PC. The worm will also block connection to many popular security websites, such as Onlinemalwarescanner, Malwarebytes, AVG and Bitdefender to name a few. If you haven’t already learnt this lesson, it is time to realise that you should always be wary of links shared by friends on social networks, whether it is Facebook, Twitter, or through Instant Messaging (such as Skype, Yahoo! or MSN) – after all, how can you tell it was a friend who sent it or a piece of malware on their computer? P.S Why not share ths on Facebook or Twitter to help warn others? Thanks for this post. It’s very common to get random messages from friends asking you to click a link when really they are infected themselves. I’d just like to add that if someone does send you an “interesting” link, you should ask them to confirm they are no a virus and to Google the actual domain name to see if there are any virus reports.